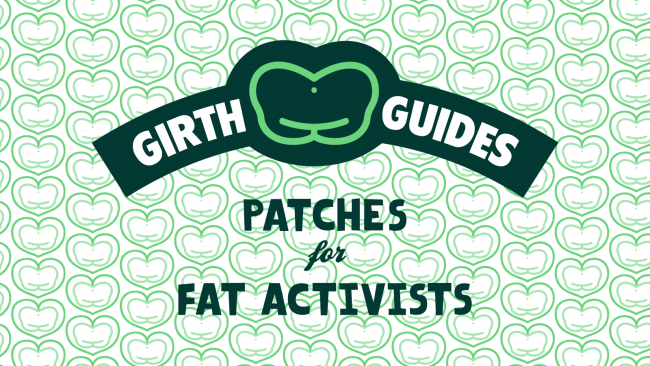 A few years ago I wanted to create a club for fat activists called Girth Guides. I love coming up with cute names for things and after I stopped patting myself on the back I registered the domain and swore I’d do something with it. My vision was an online gathering place for activists to seek community and a bit of support, a place where they could take a break from the public and private activism work that all too often leads to burn out. Shortly afterwards I experienced a mental breakdown and burnt out myself. Life became mostly about protecting myself and I ceased doing interviews and public writing and even meeting up with people and going to events. I never stopped my personal activism, and I never stopped experiencing fat stigma. It is a perpetual work, and it IS work. Many people don’t think they are doing labour when they are resisting and questioning systemic abuse and neglect. It takes a toll. Last year I saw how many artists were producing their work in patches and I remembered Girth Guides. I remembered the reason why I wanted to belong, and why I wanted a recognition of my work; so with the encouragement of my friends and peers I started to create artwork for merit patches – a small part of the concept for Girth Guides but the most tangible element. The idea was that people could validate their own experience and reward themselves for their merit. It’s about recognising how we struggle and survive and overcome. There is no measure of fatness or activism, no hurdles to jump or litmus tests. 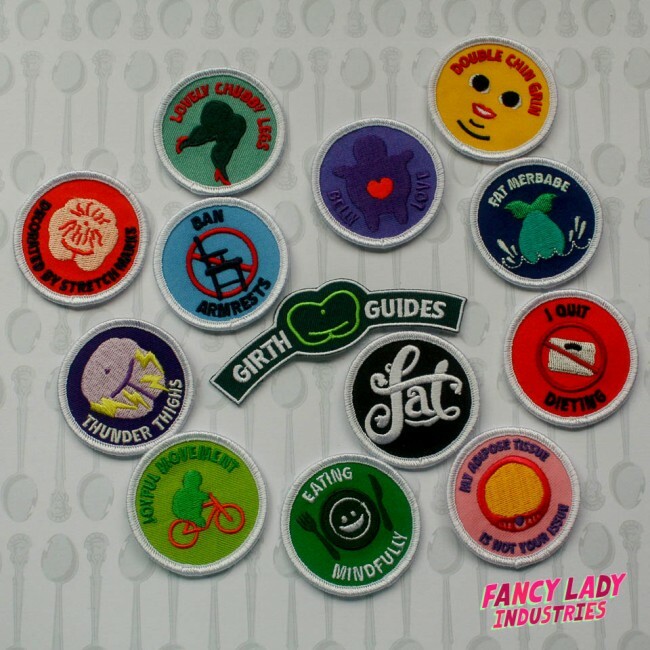 After an amazing crowdfunding campaign on Pozible, I was able to get 14 patches made and now I have distributed the rewards to my generous supporters I’m super pumped to announce they are now available on Fancy Lady Industries to purchase! My personal pink collector’s sash modelled by my dress form. The whole collection of Girth Guides patches have been sewn on. 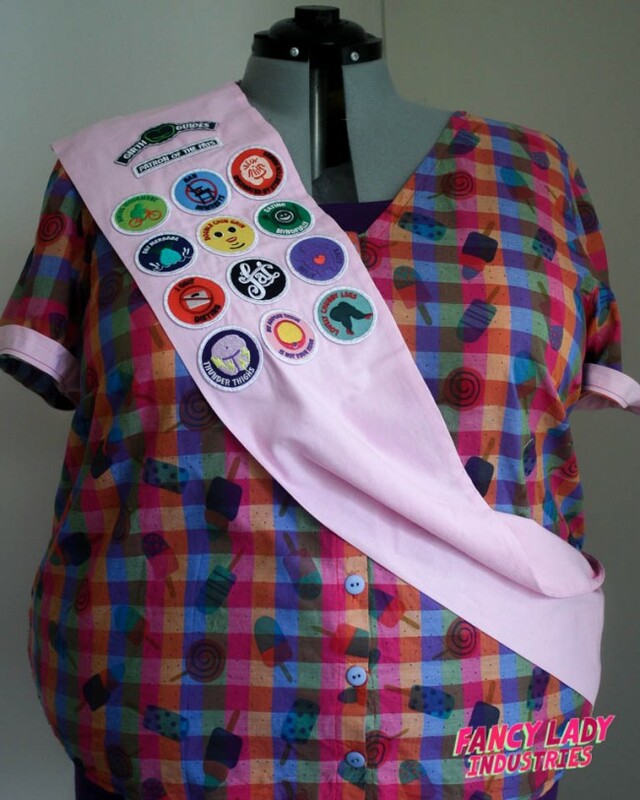 There’s a limited amount of collector’s sashes (if demand requires, I can make more!) and because I have some ultra special Patron of the Fats patches left over, I’m going to include one when you order the complete collection of patches in one transaction. These patches were offered for the very highest tier of pledges for the Pozible campaign and due to ordering minimums I do have leftovers but I do want to maintain exclusivity! So please, join me in the Girth Guides and recognise your own merit! What makes you think you’re the one? Unicorns and daisies and rainbows, oh my! True story: I sew my own pads.